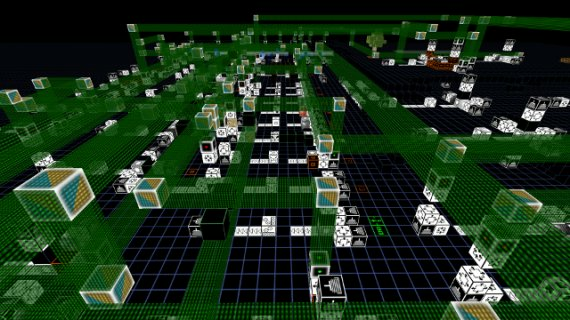 At a certain point of the game, the player will control a good amount of machines. Different machines can produce different things, and most of them can produce different things depending on the inputs. The input can be automatized quite a lot, but in both cases there is a main issue: there is not a "real" way to turn on and off machines. A craft can be avoided/stopped just removing the blackrock blue voxels, but it is not a real "human friendly" approach. Advanced actions can be performed with a computer, but it is an end-game approach. In short: a logic system to control machines is needed. A change that, maybe, could not require a massive effort is the following: the current human interfaces, the indicator light and the input switch, could be able to interact with the most of the artificial voxels. There is an atomic compressor with an adjacent materializer which is connected (with transmitters or conveyor belts) to an automatized production system. Moreover, there is a block above the atomic compressor indicating what will be produced in relation to this input. The player can put a certain amount of blackrock blue voxels inside the compressor and use the switch. This approach already works, but it is not possible to "stop" the materializer. If an input switch placed above the materializer could interact with it, this would be possible. Production system can be chained. The same output product can be used by different downstream machines. Input switches could be used to select specific chains and obtain different output without manipulating the production chain. It is easy to imagine all the possible applications of these features. Ok, put here everything you could imagine. One important thing would be a sort of content interactor, to allow the detection of the voxel stored inside the machines. We can also think to every possible gates, latches, timers, counters and so on. What do you think? Do you thing that these could be useful (and funny) mechanics? Do you think they could be implemented in the game with a balanced amount of efforts? Are there more important things that need to be implemented and have higher priority? Feedback appreciated! Yes, we are aware that there is currently a gap to fill between "dumb" automation and the programmable stuff. And that is limiting the kind of interactions that can be done. We have some reflexions and improvement plans for future updates in order to bring more production schemes. But the confirmation of the user (you) on this point is useful for us. You'll be happy to hear that many point you raised are already in our plan : logic gates, sensors and electronic circuits... and many, many more. (It's would be difficult to expose the 7 years of thinking we had around this game). All these will come. 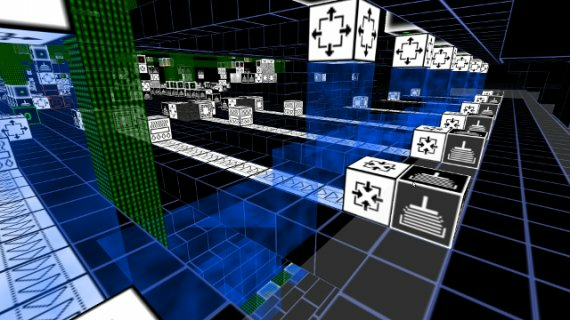 Though, these may work differently of what you described : Blackvoxel have a particular game logic and spirit . We should publish a guide to explain this. 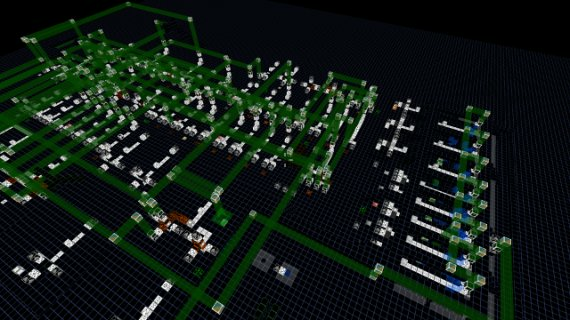 For interfaces to voxel inventory, there are already some. That's what enable automation interactions (ex: Pump->Atomic Compressor). But I guess you mean : these are stream oriented and a direct access kind is missing for some kind of future blocks or the programmable robot. We'll add one. About roadmap and priority, it's difficult to indicate when a particular feature will be implemented as the roadmap is dynamic and subjet to frequent re-evaluation and changes. This also depend on community returns. For the actual gameplay, I would recommend not trying to control the production from the source (by "blocking" it's input) but rather to control the production from the end : When a machine produce something and you don't remove the produced block, the machine will stop and wait for producing another one. Yes, some resources are immobilized in the "pending" production. But that's not a real problem as resources in blackvoxel are plentiful enough. About chaining production, I recommend to use the networks (Optical and Wireless). Several machines can be fed with one single input. You can make a factory that can build everything "on demand" with this. Thank you so much Enigma, and thank you to the whole BlackVoxel team. I am very happy you replied, and I love what you wrote. I am glad to hear that what I wrote have been already matter of thinking, and I am really excited about the direction you are going to take. I am just another user, but I want to say it: take you time, do not rush. Me and many others are impatient, but we will take what you give us, when you will give us. BlackVoxel is a great project, go on like this! Yes, we'll take the necessary time to make the things right. Blackvoxel is a long term project, what's matter is to make the right choices.